It has been a remarkable month for KNOM, as our work was honored not only by the national Gabriel Awards, but also by our peers at the Alaska Broadcasters Association (see below). We share those great honors with you. For Nome, November is a month of great seasonal change. It begins with temperatures normally rising to +28° during the day, and ends with an average daily low temperature of +2°. We will see temperatures as high as freezing only rarely until late April. As our brief autumn has turned into a hard winter, we thank you most sincerely for your prayers and your financial help. Our mission would not exist without both. May God bless you! 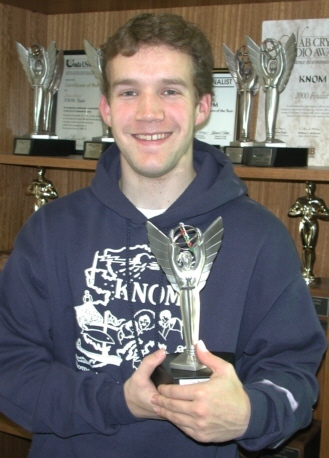 FLIGHTY: (left) KNOM�s newest volunteer, Andrew McDonnell, holds KNOM�s newest Gabriel �Radio Station of the Year� Award, with seven prior top Gabriels in the background. In the words of the Gabriel blue ribbon jury: �KNOM wowed a panel of experienced radio producers with the breadth of community service, its strong orientation to its audience�s needs and its clear commitment to the people it serves. So please accept a salute of praise and thanks from everyone at the mission. It truly is you who keep our work alive and strong. Thank you! INSPIRATIONAL SPOT: The best and most beautiful things in life cannot be seen or even touched...they must be felt by the heart. 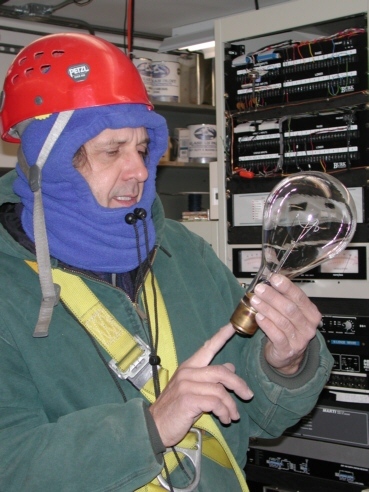 top LIGHT WORK (left): Tower expert Rod Ewing checks a new 620-Watt bulb before climbing the KNOM tower. Two of the bulbs light the flashing red beacon at the top of the antenna, 236 feet above ground. In late September, Rod and his son Josh flew to Nome for two days to give the KNOM tower its annual inspection. At the age of 30, the KNOM tower requires close watching and a careful professional checkup each year. Based in Wasilla, near Anchorage, Rod has been taking care of the structure for the past 24 years. WHAT A GUY! (left): Rod Ewing checks the tension on a north guy wire. Most of the tower�s twelve guy cables required a slight snugging up. INSPIRATIONAL SPOT: Lord, I spend so much time reliving yesterday or anticipating tomorrow that I lose sight of the only time which is really mine�the present. That�s all I have, all I ever will. Give me the faith that knows that each moment contains exactly what is best for me. Give me the hope that trusts you enough to forget past sins and future trials. Give me that love that makes each minute of life an anticipation of eternity with You. top GOLD! GOLD! (left): Volunteer production manager Mike Nurse and business manager Florence Busch display the mission�s new Goldie Awards from the Alaska Broadcasters Association. Mike won Alaska�s �Best Public Service Announcement� for an inspirational spot discussing self-esteem, which Florence voiced. KNOM�s other Goldie was for �Best Sports Play by Play,� for our coverage of the Iditarod Race finish in March. �RUSSIAN� AROUND: High-profile visits across the border are rare these days, after the nose-dive of the Russian economy. However, a few weeks ago, Nome hosted Ramon Abramovich, an oil tycoon who is also a member of the Russian Duma. Nome mayor Leo Rasmussen invited Abramovich, who wanted to learn about how towns are managed in the Alaska frontier. KNOM news director Paul Korchin interviewed Abramovich, whom he termed �surprisingly quiet and laid back� for someone the New York Times has labeled �probably the most powerful (and) wealthy�of the oligarchs.� Abramovich is by far the richest person to ever be heard over KNOM. His wealth is estimate--hope you�re sitting down--at ten billion (B) dollars! THIRTY YEARS AGO: In November 1970, a series of storms lubricated the gravel highway with a thick sheet of slippery ice. 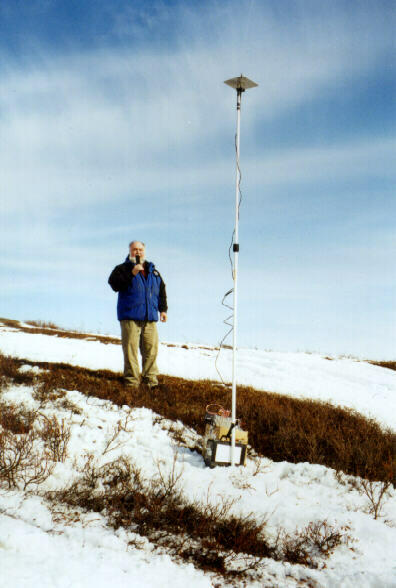 Randy McIlvain, SJ borrowed a tractor and dragged the KNOM transmitter building three miles to the newly-built tower. A surplus highway construction shed, the structure served the mission until 1997. (Left): A week before hard-packed drifts from this blizzard closed the site�s 400-foot driveway, Alaska Airlines drove a forklift the three miles, delivering the 10,000 Watt Collins transmitter. Beaming God�s Love throughout arctic Alaska--thanks to you. INSPIRATIONAL SPOT: Work for the Lord. The pay isn�t much, but the retirement benefits are out of this world. 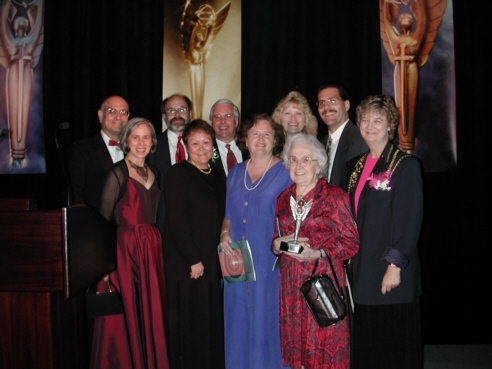 top FAN CLUB (left): After the award ceremony in Orlando, KNOM donor Dorothy Flynn, 86, holds the Gabriel, as friends of the mission join Tom and Florence Busch on stage for a group photo. KNOM has been honored by the Gabriel �Radio Station of the Year� an astonishing eight times. LIGHTS OUT: The northern lights, that is, which provided western Alaska spectacular displays in October. From Nome, you can see some aurora on about half of winter�s clear nights, usually after midnight. Last month, however, we enjoyed several dazzlers in mid-evening. BARGE IN: October 4th, the last oceangoing barge from Seattle anchored off Nome, bringing the final supplies at a relatively inexpensive 13-1/2¢ a pound. Pickup trucks were piled high with shaky stacks of freight, as many families drove home their winter�s supply of canned vegetables and fruit, flour, sugar and paper goods. Most people tuck the supplies away in closets, though some cover heavy cases with blankets, and at least for a while, disguise them as living room end tables! 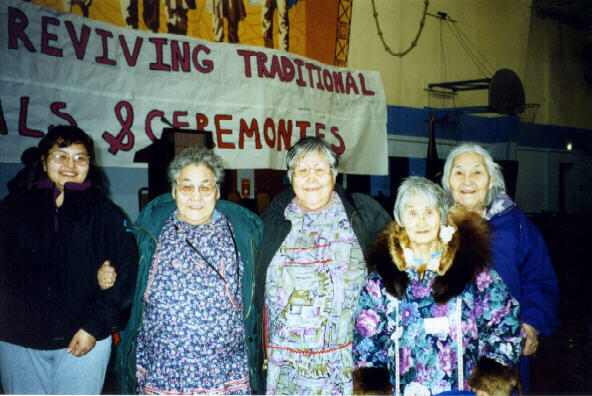 THE OLDEST CATHOLIC RADIO STATION in the United States, KNOM beams inspiration, education, news, important information, the Rosary, Sunday Mass, native cultural programming and cheering companionship into Eskimo and Athapascan Indian villages scattered throughout 100,000 square miles of roadless western Alaska. Our programs include hourly news and life-saving weather information, interviews and discussions of vital issues, music, entertainment and inspirational and educational spots. We have been honored by many awards. By far the greatest tributes are the loyal and enthusiastic listenership by our far-flung audience, and your support and confidence. We are owned by the Catholic Diocese of Fairbanks, and our only major source of income is the private contributions by good people like you. Thank you! DO WE COUNT? Well, we estimate. At the start of November, KNOM had broadcast a total of 29,200 inspirational spots so far this year, and an equal number of educational ones, most of them produced in the KNOM studios. Each of us has so much to be thankful for, don�t we? On Thanksgiving Day, as every day, our prayers will remember you in gratitude for your kindness to our mission--your financial help, your prayers and your warm words of encouragement. Thank you once more, and may God bless you a thousand times over! INSPIRATIONAL SPOT: Half the things that people do not succeed in, are through fear of making the attempt.